The days have been very warm, which have been allowing the last of our green tomatoes to make the push to being vine-ripened. The summer warmth hangs on into the evening until the breeze comes in and temperatures cool off. The last few mornings have left a thick layer of dew on my windshield – enough that turning the wipers on leaves rainbow stripes of mud – not very effective. The greenhouses are delivering transplants as fast as we can tuck them into the ground. Kales, chards and little cauliflower plants arrive in bins that are lined with a racking system that is able to hold transplant trays over each other. The crew pulls one tray at time out and stacks them onto the mechanical transplanter that is coupled to the back of a tractor. Folks sit on the transplanter, and pluck plants out the their trays and place them into a rubber “hand” on the transplanting machine that tucks the plants into the ground at a uniform spacing and in a straight line. I stop to get onto my knees to more closely inspect the baby plants. I see worm droppings and holes in the leaves. It doesn’t take long to find the tiny guys hiding on the shady side of the leaf. As I look more closely, I see another green little guy creeping across the dirt. They are small, green and very soft – I squash a few between my fingers. Tomorrow, the guys will apply an organic worm killer BT. It only kills worms, not harming the other little critters that call the field their home. The application needs be followed by a period of time without water to ensure the mild product doesn’t get washed off the plants before the worms take a few more bites of it. 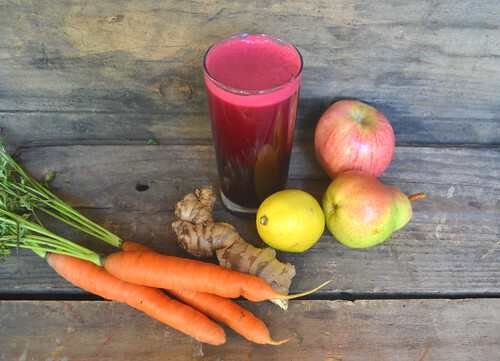 This juice with beets, carrots, apple and pear is a great juice to play around with varying flavors. Add more pears, apple or ginger if you don't want to taste the beets at all, or stick to just one apple and pear each with no ginger to taste the earthiness of the beets and carrots. 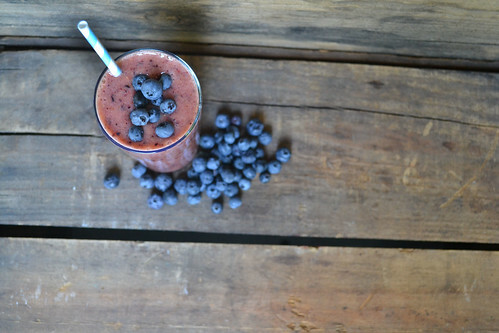 Either way, this juice is delicious and a great way to get your fruit and veggies for the day! Blender/Food Processor Directions: Peel the beets and and carrots and remove the stems. Cut the beets, carrots, apple and pear into small chunks and add them to the blender or food processor. Process with some water until smooth. Taste and add fresh-squeezed lemon juice and grated ginger if desired. The more ginger you add, the less you will taste the beets. Pour into a glass and enjoy! Juicer Directions: Cut the beets, apple and pear into sizes that will fit down the chute. Feed them down the chute one at a time until processed. Taste and add fresh-squeezed lemon juice and a knob of ginger if desired. The more ginger you add, the less you will taste the beets. Pour into a glass and enjoy! 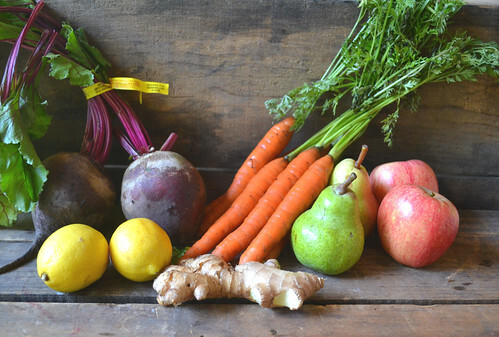 How To Add Juicing Fruits and Vegetables To Your Delivery: CSA members - head on over to our online Farm Stand Market to customize your upcoming delivery. On the second page of customizations, you’ll find “Produce by the Case” and can stock up if you want a larger batch of produce for juices and smoothies. The Market is open from noon on Thursday until 10 am, 2 days before your scheduled delivery day. After you confirm your produce items, click the orange button "Confirm and Continue To Other Farm Products" to add the products to your delivery. Looking for a fresh new way of fundraising for your school? It’s time to think outside the box, or in this case, inside the box! 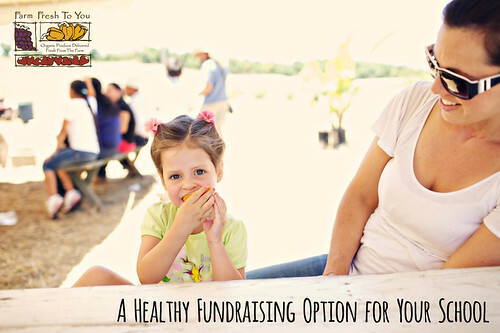 Through our farm's Healthy Fundraiser, you can easily earn money for your school (year round!) while also promoting healthier eating habits. We work with your school to choose the fundraising model that works best for your organization. Your school then shares their special promo code. When current or new Farm Fresh To You members use your school code, your school earns money. We will deliver fresh, organic and seasonal fruits and vegetables right to participants’ doorsteps. Raise the much needed funds for your school, get your family and friends to eat healthier and support local farms all at the same time. Starting a healthy school fundraiser will build a strong connection with students for local farms and help to teach the next generation to value fresh produce as part of a healthy diet. Let’s Grow Healthy Students! Healthy Fundraiser – Turn students into healthy eating advocators! Supports Your Community – Fruits, veggies and farm products are sourced from local farms. Simple – No points to redeem, no forms to mail in and no fees. We do all the work for you! Convenient – When current or new Farm Fresh To You members use your special promo code, your school earns money – year round! If you're interested in learning more about this program for your school (*see limits below), please contact us at wellness@farmfreshtoyou.com. We can help work with your school to choose the best fundraising model and promo code. *Fundraising program is limited to schools in our California delivery areas. 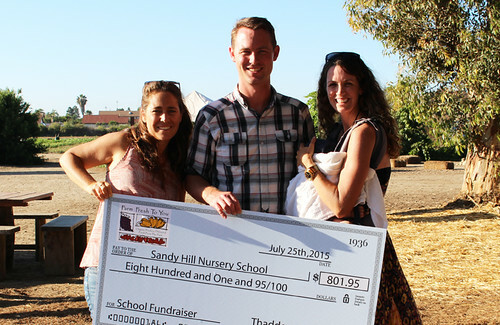 Sandy Hill Nursery School has been our Fundraising Partner since September of 2014. 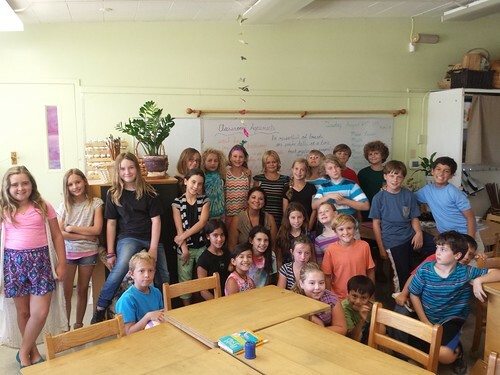 We recently presented their school with a "big check" at our Farm-to-Fork Summer Feast on the Farm at Suzie’s Farm in San Diego. Here’s what Lara had to say about participating in our Fundraising Program this past year. It has been such a pleasure working with the Farm Fresh To You family. With their support of the Healthy Schools fundraiser our nursery school raised over $1,200.00 this last school year (and still counting!). We found many parents registered for the Farm Fresh boxes as the high quality certified organic produce, customization option and direct home delivery made it an easy option for those interested in leading a healthy lifestyle while still balancing a busy schedule. Ever Tried A Shrub Cocktail? Mixing cocktails can be fun or difficult, depending on your cocktail-mixing abilities. We love anything that makes mixing cocktails easier and these shrubs are perfect. A shrub is a syrup made from fruit and vinegar. The vinegar preserves the fruit, which is then used to mix cocktails or mocktails. (Check out our Homemade Plum Shrub here if you want to make your own). 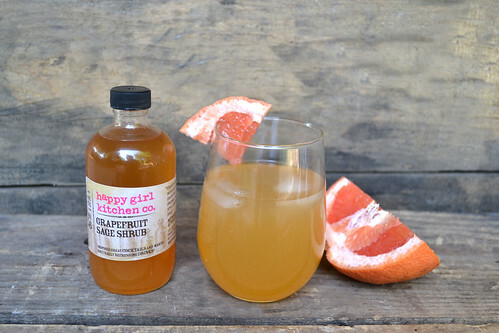 These shrubs from Happy Girl Kitchen Company are not only delicious and convenient for making cocktails, but they're awesome flavors too. 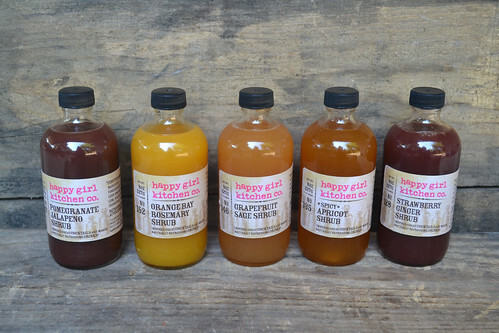 Happy Girl Kitchen Company is located in Northern California and hand makes shrubs, jams, pickles and more. They work closely with area farmers and use organic produce for all their products. If you want a non-alcoholic drink, feel free to take out the alcohol (skip the mimosa, as Prosecco is a main ingredient). The drinks we've created taste good with and without the alcohol. 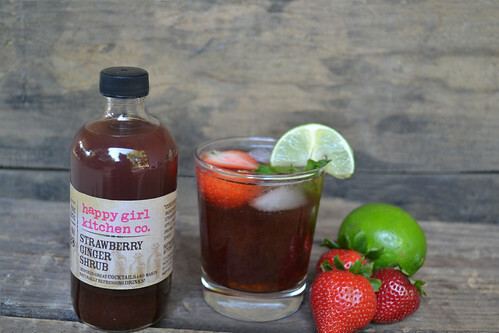 Combine strawberry ginger shrub, vodka (if using) and ginger beer and stir to combine. Top with ice, mint leaves and a squeeze of lime. Cheers! Combine the Orangebay Shrub, rum (if using) and club soda and stir to combine. Top with ice and enjoy! Pour the shrub into your favorite glass. Top with Prosecco and stir gently to combine. Garnish with grapefruit slices if desired. Cheers! 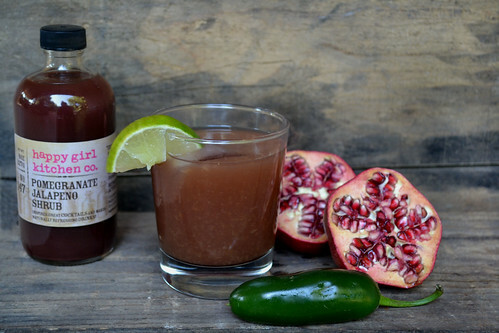 Combine Pomegranate Jalapeno Shrub, tequila, triple sec, orange juice and lime juice if using. Stir to combine. Add ice and serve. How To Add Happy Girl Kitchen Shrubs To Your Delivery: CSA members - head on over to our online Farm Stand Market to customize your upcoming delivery. The Market is open from noon on Thursday until 10 am, 2 days before your scheduled delivery day. After you confirm your produce items, click the orange button "Confirm and Continue To Other Farm Products" to add the products to your delivery. It’s evening after the heat of a summer afternoon, and I am walking down the dusty, gravel road that curves along the canal through the farm. The canal is no longer full of water like it has been since May, but it still has water and is scheduled to be shut off in a week. This doesn’t worry me. Our peak water use passed with the month of August, and our wells will be sufficient to get us through fall. Beyond the canal, our first planting of heirloom tomatoes has been disassembled. The vines once supported by stakes and string that towered over six feet tall now lie on their sides in awkward lumps. Soon this field will be chopped, disked and planted to cover crop, and these tomato vines and their crop will be remembered only on my Excel sheet that tracks crop history by field: 2015 - C6 - Heirloom Tomatoes. On my left, a freshly planted field of kale is neatly organized. Each bed has three lines of little plants. The field has three different types of kale, and the plants have not yet grown into each other, leaving individual plants and the grid patterns of the field. Looking over the field, the color difference of the red, green and lacinato kale atop the rich dark soil is as beautiful as any rainbow that has stretched across our farm. Beyond this field, the hills rise with dry grass that is worn into a golden color from the summer sun. On the golden hills, dark oak trees stand with their crop of acorns that have started to fall. Watching over our farm, the oaks keep time of the seasons with the color of their leaves as they have done long before we were here. The sun is entering its golden hour, making magic with the colors and textures of the farm. In the fallen tomatoes, I see a coyote who already sees me. We look at each other, both wondering what the other will do until we both keep going about our evening activities mindful the other is still there. In the evening breeze, there is a particular smell that has blown in. It is the smell of something that has aged - musty and delicious. Soaking it in with deep breaths, I am happy that fall is close enough to smell. Check us out on Instagram @farmfreshtoyou and @farmerthaddeus). 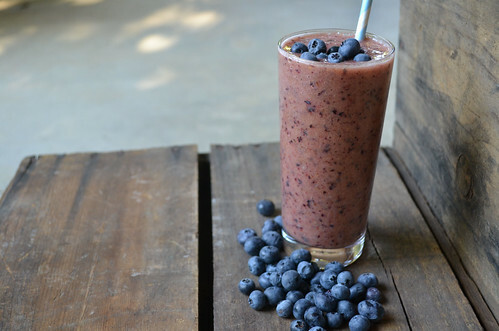 This blueberry bliss smoothie is so delicious and makes a great breakfast or on-the-go-snack. This is a great recipe for kiddos, too. Though we used fresh fruit in this smoothie, freshly frozen fruit also works and results in a thicker smoothie consistency. (If you are freezing bananas, remove the peel and place in a resealable freezer bag. Once frozen, break in half and add to the blender or food processor). 1/4 cup or more apple juice, depending on your smoothie thickness preference (less apple juice = thicker smoothie). We used Solana Gold, available when you customize your box. Put all of the ingredients into a blender or food processor and blend until combined. Add in more fruit or juice depending on how you like your smoothie consistency. Enjoy! 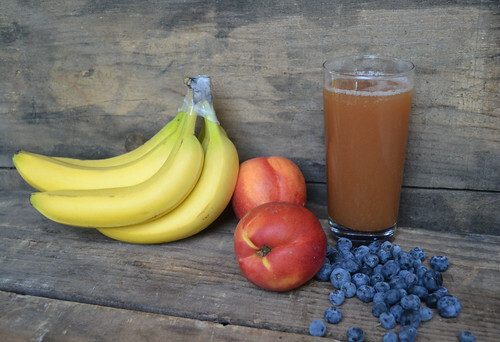 How To Add Smoothie Fruits and Apple Juice To Your Delivery: CSA members - head on over to our online Farm Stand Market to customize your upcoming delivery. On the second page of customizations, you’ll find “Produce by the Case” and can stock up if you want a larger batch of produce for smoothies. You will also find the Organic Gravenstein Aple Juice among "Other Farm Products." The Market is open from noon on Thursday until 10 am, 2 days before your scheduled delivery day. After you confirm your produce items, click the orange button "Confirm and Continue To Other Farm Products" to add the products to your delivery. 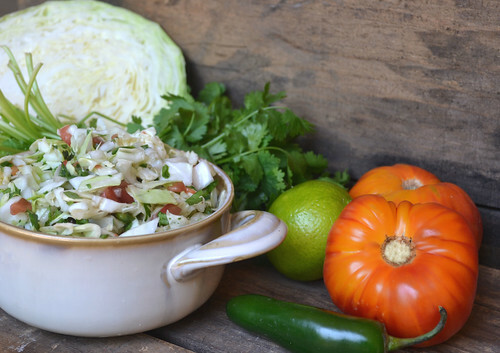 This refreshing salsa is one of our favorite ways to eat cabbage. 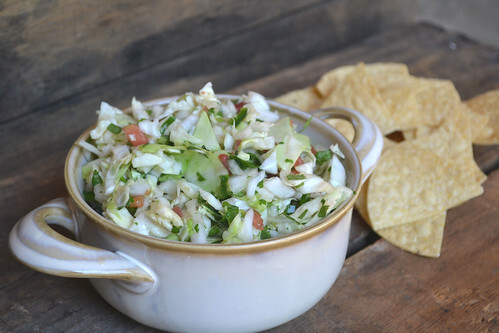 The lime juice softens the cabbage, while still maintaining that delightful cabbage crunch. We like eating this on chips, but it's also fantastic topped on tacos. In a large bowl, combine the cabbage, jalapeño, onion, cilantro and tomatoes and toss well to combine (we used a big metal spoon). Pour the lime juice over the top and mix again. Season to taste with salt. Put the salsa in the fridge for an hour before enjoying so the flavors can marinate and the lime juice can soften the cabbage. (You can also enjoy right away, but the flavors will meld together better after sitting). How To Add Salsa Ingredients To Your Delivery: CSA members - head on over to our online Farm Stand Market to customize your upcoming delivery. Click "Customize This Box" and add any salsa ingredients you need. The Market is open from noon on Thursday until 10 am, 2 days before your scheduled delivery day. After you confirm your produce items, click the orange button "Confirm and Continue To Other Farm Products" to add the products to your delivery. At farmers markets as a child, the summer season was filled with Crimson Sweet Watermelons. They were the best tasting watermelon loaded with tons of black seeds, but their crisp flavor was divine. They were a hassle to move often weighing 15 to 20 pounds each. They were harvested into bins, loaded and unloaded one melon at a time by creating a melon chain and tossing them through three people from the bin into the van and then out of the van into the bin at the market stand. But they were SO good that samples of them would stop people in their tracks. Once customers would buy them, we often had to lug them to their vehicle. Some plant breeders recognized an opportunity. What if we could make a seedless watermelon that was small – a personal-sized, pure heart watermelon that tasted great. With this notion, generations and generations of watermelon were grown, selected, hand pollinated to another and so on. The results are two parent plants both of which produce seeds that if they were planted produce a melon identical to the parent. Both of which do not have the full set of qualities desired for the mini red seedless watermelon we grow. However, when these two are crossed, they create a hybrid seed (F1), which contains the genetics required to grow small, seedless watermelons. The process used to create this seed is traditional plant breeding. They are not Genetically Modified Organisms. These watermelons were created with the same type of plant breeding that had been used long before GMO technology existed. GMO seeds are created when a piece of DNA from one organism is teased into the DNA of another organism using techniques that would never happen naturally. Hybrid plants are created when plants are selected for specific traits generation after generation creating two parent plants that have very specific traits. Those two plants are grown and pollinated with each other. In the case of watermelons, this pollination is done by hand. The seeds created are then planted into production fields, yielding the F1 generation of fruit that we grow, harvest and sell. You can imagine the amount of time and effort it must have taken to breed a plant that does not create offspring. This is how capitalism works. If a demand for a product is large enough, it will be created. This watermelon’s inability to procreate due to is lack of seeds is the very trait that has caused its cultivation to exponentially expand and now this cultivar is thriving and more watermelons are being produced than ever before – ah, the irony. 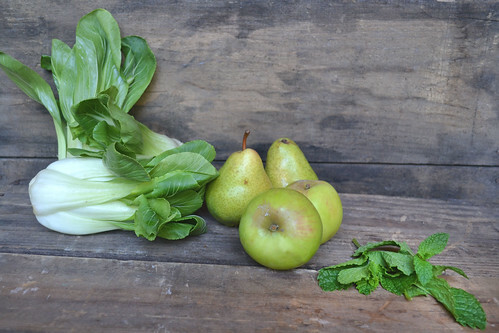 Bok choy seems like it might be an odd choice in a juice, but it actually complements the pear and apple fantastically in this lean green Gravenstein juice. 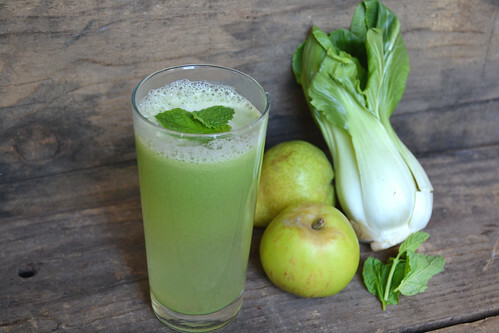 Bok choy contains tons of vitamin A and has a low calorie count, making this green juice a great way to start the day! Blender/Food Processor Directions: Cut the pears and apples into small chunks and add them to the blender or food processor. Process with some water until smooth. Roughly chop the baby bok choy and add to the food processor. Mix until combined. Add a handful of mint and blend. Taste and add more mint leaves if desired. Pour into a glass and enjoy! Juicer Directions: Feed the bok choy, apple halves and pear halves down the chute one at a time until processed. Add a handful of mint. Pour into a glass and enjoy! Note: This juice separates if not enjoyed immediately. No need to worry, just shake it or stir it up again. How To Add Juicing Fruits, Vegetables and Mint To Your Delivery: CSA members - head on over to our online Farm Stand Market to customize your upcoming delivery. On the second page of customizations, you’ll find “Produce by the Case” and can stock up if you want a larger batch of produce for juicing. The Market is open from noon on Thursday until 10 am, 2 days before your scheduled delivery day. After you confirm your produce items, click the orange button "Confirm and Continue To Other Farm Products" to add the products to your delivery. Hard-boiled eggs can be tricky. If you cook them too long, the yolk turns green. An overcooked yolk is like overcooked asparagus -- nobody wants that! If you don't cook your eggs long enough, then you get a soft-boiled egg (which is delicious, except for when you're aiming for a hard-boiled egg). 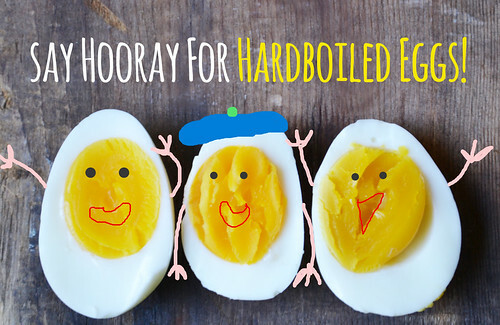 Our technique results in a perfect hard-boiled egg, every time. (You can use duck, goose or whatever eggs you prefer, but cooking time will vary due to the size of the egg). Place the eggs in a large saucepan and fill with water so there's about 1 inch of water covering the eggs. Bring the water to a boil, then immediately remove from heat and cover with a lid. Let the eggs sit for 10 minutes (time it!). Fill a large bowl with ice water. When the 10 minutes are up, remove the eggs from the saucepan with a slotted spoon and into the water to cool. To peel the eggs, crack the eggs all over the shell and carefully peel the shell away from the egg. Rinse off any extra shell bits and enjoy! 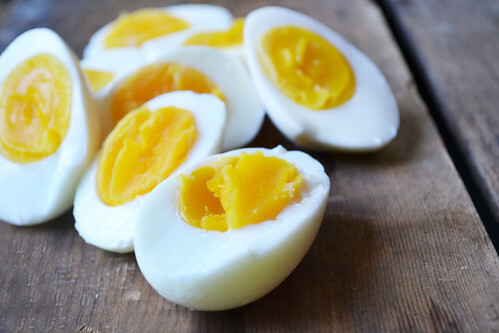 We also love bringing hard-boiled eggs in a packed lunch for a protein addition. They're great on their own or with a salad. How To Add Eggs To Your Delivery: CSA members - head on over to our online Farm Stand Market to customize your upcoming delivery. On the second page of customizations, you’ll find our egg selection. The Market is open from noon on Thursday until 10 am, 2 days before your scheduled delivery day. After you confirm your produce items, click the orange button "Confirm and Continue To Other Farm Products" to add the products to your delivery. Sorry Julien. I should know how to spell your middle name because it’s my middle name, and I should know the difference between the girl and boy spelling because my mom’s middle name is Frances not Francis like mine. I didn’t let it get me down. Spelling is something I have struggled with my entire life. As a child, I once put a fake note about a child in trouble in a bottle while camping and tossed it down the stream. My younger brother and I spent the afternoon chasing the bottle down the stream, freeing it from any snags it found. The note made its way to the authorities who said, “The spelling was so terrible we figured it must have been a foreign child not a joke from a domestic child.” FBI showed up at my friend’s house – whoops. I was so confused. Georgette showed me one of the notes. “Our cucumber harvest fell short today, so we are replacing the cucumbers you were supposed to receive with zucchini. Sorry for the incontinence.” I blame spell check for that one and until then I never really considered how similar inconvenience and incontinence were. Those close enough to poke fun at me would waste no time gleefully pointing out that they really aren’t that similar. Sorry Julien Francis! Enjoy your boxes this week, and enjoy the summer produce! 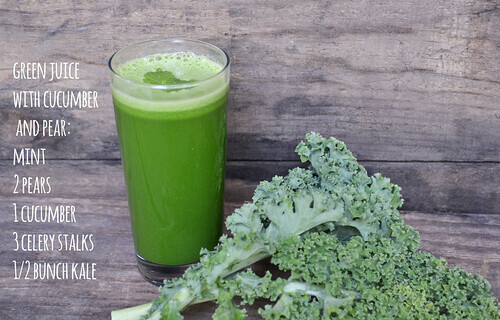 This green juice is perfect to start with if you've never tried green juice. Though there are vegetables in this juice, the pear and mint make it a little on the sweeter side and balance the kale and celery. (You'll hardly be able to taste the kale, if at all). Blender/Food Processor Directions: Cut the pears, cucumber and celery into small chunks and add them to the blender or food processor. Process with some water until smooth. Roughly chop the kale and add to the food processor. Mix until combined. Add a handful of mint and blend. Taste and add more mint leaves if desired. Pour into a glass and enjoy! Juicer Directions: Feed the kale, celery stalks, cucumber and pear halves down the chute one at a time until processed. Add a handful of mint. Pour into a glass and enjoy! Radishes can be a difficult vegetable if you don't know what to do with them. 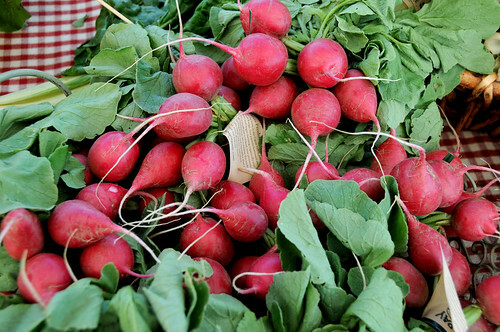 Often found in salads, radishes are a slightly spicy vegetable with a pleasing crunch. Sometimes the spicy flavor of the radish can be a little overwhelming, so we've come up with three recipes that tone down the overpowering radish flavor. The crunch of the radishes pairs perfectly with creamy butter in this delicious and pretty appetizer. Using a kitchen mandoline or sharp knife, thinly slice the radishes. Place them in a bowl of cool water and let sit for 10-20 minutes (this takes some of the spicy bite out of the radishes. Soak them shorter or longer depending on your preference). Drain the radishes. Meanwhile, toast the baguette slices and spread with butter. Sprinkle sea salt over the butter. 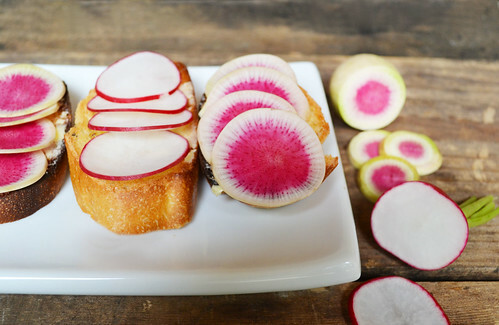 Layer the slices of radishes over the top and enjoy. When roasted, radishes taste similar to roasted cauliflower or a mildly-spiced potato. With brown butter drizzled over the top, how can you go wrong? Preheat the oven to 450 degrees Fahrenheit. Thoroughly rinse the radishes and their green tops. Chop the green part and set aside. Cut off the bottom of the radishes and discard. Slice the radishes vertically in half (from top to bottom instead of around the middle). 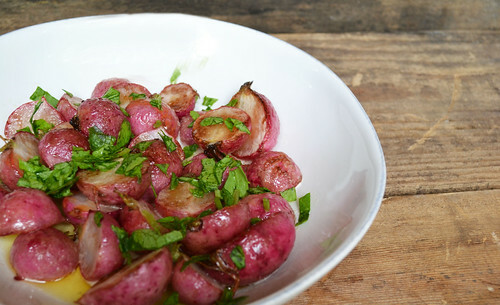 Place the sliced radishes in a baking pan and pour the tablespoon olive oil over the top. Mix the radishes so the olive oil gets distributed. Season with salt. Roast for 20 minutes or until radishes are golden brown, stirring occasionally. Melt butter over medium heat in a small saucepan. Swirl the pan so the butter browns, but doesn't burn. Once beginning to brown, remove from heat. Drizzle over the roasted radishes and garnish with the chopped radish greens. Season with salt to taste. These easy and quick radish pickles have an amazing flavor and crunch! We love them on tacos, salads and just to snack on. Rinse the radishes. Using a kitchen mandoline or a sharp knife, thinly slice the radishes. Discard the ends. Place the radishes in your pickling container of choice (we used a Weck jar) and refrigerate while you prepare the other ingredients. In a small saucepan, combine the red wine vinegar, sugar, salt, mustard, coriander seed and peppercorns. Bring to a simmer over medium-high heat, stirring until sugar dissolves. Remove from heat and let cool. Remove the radishes from the fridge and pour the brine over the top. Refrigerate for 20 minutes before digging in. 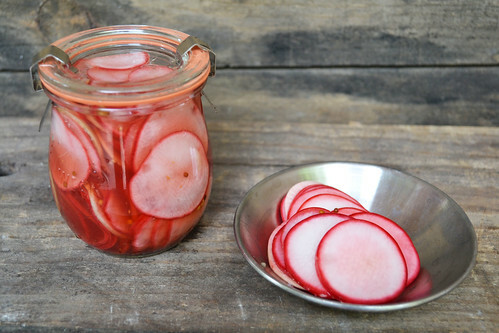 Enjoy immediately, or for up to 2 weeks (the radishes will soak up the pickling flavor the longer they sit). How To Add Radishes To Your Delivery: CSA members - head on over to our online Farm Stand Market to customize your upcoming delivery. The Market is open from noon on Thursday until 10 am, 2 days before your scheduled delivery day. After you confirm your produce items, click the orange button "Confirm and Continue To Other Farm Products" to add the products to your delivery.